While the task of being in sole control of eco-friendliness at home may sound ominous and challenging, it’s most definitely not. Here are 55 simple things you can do at home that prove that it isn’t. Install a programmable thermostat and heat or cool your home only when someone’s present. Switch to reusable bags, rather than plastic, for your groceries. Disable your computer’s screensaver. Have the monitor power itself off after idling instead. Open your blinds and curtains and use natural light as much as possible. Change furnace air filters every 3 months to keep air flowing efficiently. Turn your computer off instead of letting it sleep or hibernate. Follow your fridge’s manual on how to clean its condenser coils. Dust buildup on these reduces efficiency. Hang your laundry to dry instead of using the dryer. Buy less packaged foods and buy in bulk when possible. This will reduce the amount of packaging waste you produce. Reuse scrap paper. Let your kids doodle on the other side. Choose online versions of your favourite magazines and newspapers. Use an e-reader, tablet or phone to read e-books. Water lawns and gardens in the morning or evening to prevent the evaporation of water during the heat of the afternoon. Buy or acquire used items instead of buying new. Try Kijiji or Freecycle. Use cloth instead of paper to clean. Re-purpose old t-shirts and towels as rags for cleaning. Seal exposed duct work in the basement or attic to prevent leaks. Use CFL (Compact Fluorescent Lightbulb) or LED bulbs instead of incandescent ones to save energy. Turn the tap off when brushing your teeth or scrubbing when washing your face. Use your dishwasher. Newer dishwashers use as little as 4 litres of water per load. Water flows out your tap at a rate of 4 litres per minute. Minimize rinsing before putting dishes in the dishwasher. Newer dishwashers don’t need this step. Open windows when weather permits for odor control and cooling. Most cooling systems are closed systems; they don’t bring air into the home. Donate or recycle clothing rather than throwing it in the trash. Use rechargeable batteries and dispose of used batteries properly. Use cloth napkins instead of paper napkins at meals. Have a meat free day. 2,500 gallons of water are required to produce a single pound of beef and animal agriculture creates as much as 18% of greenhouse gases. Recycle. And think outside your blue bin when recycling. Find out where you can recycle items such as clothing, e-waste and plastic bags. Run errands in batches to save fuel. Fix a leaky toilet. Leaky toilets can waste up to 4 litres of water a minute. Put a drop of food coloring in the tank. If the food coloring is in the bowl 2 hours later without flushing, the toilet’s flapper is leaking. Go paperless. Cancel paper bills, bank and credit card statements. Use car washes instead of washing your car at home. The car wash uses the least amount of water possible to clean your car. You probably don’t. When throwing parties, don’t use disposable cups and plates, but if you must, label them. This prevents guests from losing track of them and using more. Use electronic versions of tickets or boarding passes when possible. Ride a bike or walk to local destinations. Fix a leaky faucet. A faucet dripping at a rate of 1 drop per second can waste over 11,000 litres per year! Use an insulated lunch bag instead of paper or plastic. Cover your pool when you’re not using it to keep it clean and prevent evaporation. Remove roof racks and any other extra items in your car to improve fuel efficiency. Donate your used items or sell them rather than throwing them out. Try Freecycle if you can’t find anywhere to donate your goods. Make your own non-toxic cleaning products, or choose eco-friendly ones if you’re buying. Try reusing or repurposing old items before throwing them out to reduce your need for waste disposal. Wear more or less clothing and choose thicker or thinner blankets before turning up the heat or air conditioning. Carry a reusable glass or stainless steel water bottle rather than drinking bottled water. Use manual tools gardening tools like a rake and push mower instead of your leaf blower and gas powered mower. Choose Energy Star-qualified appliances when upgrading or buying new. Keep your freezer full, even if it means filling it with containers of water. A full freezer doesn’t have to run as often. 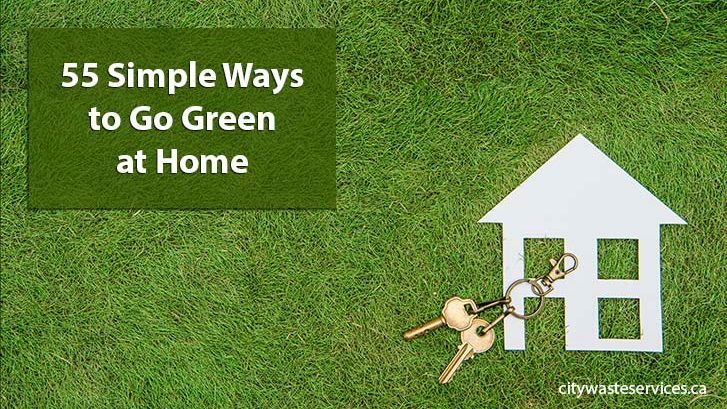 We promised you a list of simple ways to go green at home, and there it is. Armed with this list you can start making little changes to go green at home that can make big differences for our environment.